Steve Spangler recently participated in #TeacherFriends Twitter chat and met some amazing teachers. Here are the questions and his longer-formatted answers about science education today. 1. Why is early childhood science education important? For young learners, science is just an extension of their everyday world. We don’t have to teach young children how to wonder, discover, and explore through play because they do it naturally. The myth is that we have to convince children that science is fun. Are you kidding? Science has always been fun for children… if it’s presented in the right way. When people say they don’t like science, it’s most likely because of a bad experience they had as a child. It was the EXPERIENCE that shaped their negative opinion. That’s why it’s so important to focus on working with early childhood educators to learn how to create amazing experiences that encourage discovery through play, asking questions, exploration and using creativity to solve simple problems. It’s next to impossible to erase bad experiences. On the flip side, amazing experiences turn into unforgettable learning experiences that can inspire and motivate children to want to learn and explore more on their own. When it comes to teaching science, early childhood educators have tremendous impact and influence on shaping the thoughts and opinions of children. Research shows that most children have formed an opinion (either positive or negative) about science by the time they reach the age of 7. That puts a tremendous about of responsibility on early childhood professionals, especially with all of the emphasis being placed on STEM education. Teaching science is not an option for the early childhood educator… it’s a MUST! We as teachers have the opportunity to create amazing experiences that will have a lasting impact on our students throughout their entire school experience. Our actions today in the area of early childhood science education will have a greater impact on growing next generation scientists than any other STEM initiative currently being discussed at the state and national level. Early childhood educators have far more impact and influence on a child’s potential to seek out a career in science or engineering than any other grade level. Yet, all of the money is being poured into middle and high school STEM initiatives. This issue has become my passion… my soapbox in education because it’s the one thing we can do right now that has the potential of changing the future of science in America forever. If a teacher has information, the learner will use you and discard you. If the teacher has knowledge, the student will call upon you only when they need you. But if what you have is wisdom, the learner will respect you forever. Impact and influence is built on respect. If we’re going to have a profound impact on the way our children view science, we need to earn their respect. And it all starts with creating unforgettable learning experiences that never lose the element of fun. 2. Whenever you’re speaking at a conference, you tell the audience, “If it gets to the dinner table, you win.” In terms of teaching science, what do you mean? It’s a phrase that my principal helped me to understand when I taught science at the elementary level. If what you have to teach is so cool, so compelling, so exciting that your students talk about it with their parents and siblings at the dinner table later that night, you win as a teacher. In an age when children are being bombarded with activities and “things” to do, creating experiences sets you apart from everything else. There are good teachers and then there are truly great teachers. Understanding the differences in teaching styles is the key to learning how to turn ordinary moments into unforgettable learning experiences – the kind that kids talk about at the dinner table and remember for a lifetime. The secret to becoming the best teacher possible is to learn how to engage students on a whole new level using creative methods that promote wonder and exploration. Good teachers share the facts while great teachers weave facts into real-world applications. Good teachers may do “activities”, but great teachers create unforgettable learning experiences. You might be sitting here today because of the efforts of a great teacher. When I think back on my truly great teachers, I don’t anymore remember much of what they taught me, but I sure remember being excited to learn it. These were the teachers who listened to our ideas, respected our thoughts, open our minds and taught us to think differently. It really didn’t matter what they were trying to teach… I was just infected by their love of learning. The sad part is that some people might go through all of their schooling with just good teachers. Don’t get me wrong… good is not bad… it’s just not great. Good teachers do things… great teachers inspire students to change and grow. 3. What are your thoughts on building a bridge in science between home and classroom? 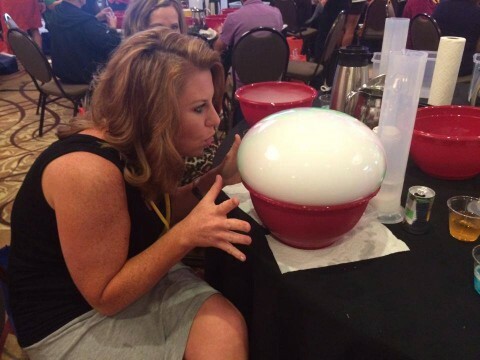 One of the attributes of an amazing science teacher is to watch how he or she uses a cool science demonstration to grab the students’ attention and stimulate their natural curiosity. Great science teachers use demonstrations in such a way that they invariably precipitate the question, “How did you do that?” There is evidence to show that students retain science concepts much longer when they are shown an engaging demonstration that provokes an inquisitive response and that challenges them to figure out why. If the science demonstration served its intended purpose, the students will come alive with a stream of questions, and it’s the job of a great teacher to help the young scientists turn their questions into an unforgettable learning experience. You don’t need to have a degree in chemistry to help your children become better science thinkers. As parents we should model our own curiosity by making observations about the world around us, asking questions, and trying to explain why things are the way they are. Just by being curious, observing and asking how things work, you can peek a child’s natural curiosity and create a desire to want to learn more. Ask your children lots of “why” questions. 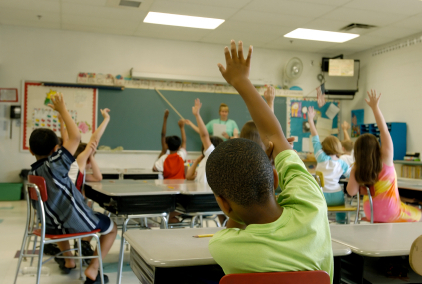 Even if you don’t know the answer, asking the question helps to develop critical thinking skills. It’s not so much that you don’t know the answer, it’s that your child asked the question in the first place. Encourage children to solve problems. Learning how to find answers is a lifetime skill. Visit your child’s science class. By visiting the classroom, this shows both your child and the teacher that you are interested in science. If you are unable to personally visit the class, make it a point to inquire about what your children are learning about in science. Ask questions about science programs at the parent-teacher conferences or PTA meetings. Find out if students are doing inquiry-based experiments and hands-on activities as part of their science curriculum. Inquire about science assemblies, guest speakers, and programs that have been successful in other schools. See if there are activities you can do at home to supplement class instruction. Seek out ways to help your child’s teacher and school. Volunteer to help with science related field trips, find materials and equipment, start an after-school science discovery club, or assist with classroom science projects. Check homework and don’t expect that all homework will be easy. Look at completed work regularly. If you had a bad experience with science when you were in school, don’t expect that your child will have a similar experience. Be positive in your comments. Keep past math and science homework, notes and tests. Put all materials in a binder so your child can check earlier work when he or she needs a refresher. This binder is actually a portfolio that shows your child’s progress from the beginning of the school year. Challenge your child to “prove it!” The job of a scientist is not to just arrive at a stab-in-the-dark answer but to prove what he or she believes to be true using good scientific reasoning. Whether or not your child comes up with the correct answer to a problem, play the devil’s advocate and challenge them to “prove it.” Questions like, “How do you know that?” help to develop critical thinking skills and help the child to analyze his or her own reasoning. Show how science relates to the real world. Try to relate science to real-life situations, such as understanding the concept of air pressure to predict the weather, or how recycling helps the environment. 4. I see that you have started offering online teacher training. Why? Sweeping changes in education are forcing teachers to seek new ways to find quality professional development opportunities. “A new wave of travel restrictions and significant budget cut backs are forcing teachers to postpone plans to attend a conference or workshop and consider other alternatives for their own professional development needs,” says Spangler, who is also fearful of the long-term impact this will have on classroom instruction. “Over the past few years we’ve had a number of educators and administrators ask us for an online version of our hands-on science workshops in an effort to work around travel and budgetary restrictions,” says Spangler. Going virtual requires the trainer to use new strategies and instructional methods to keep the long-distance learner constantly engaged and committed to the learning experience. #1: NO travel required! This is a fully online training experience that brings the interaction and fun of a Spangler workshop experience to your home, school or any place you can find an Internet connection. #2: You’ll have access to more than 6 hours of science instruction that’s easy to access on the Spangler Online Learning platform. Bring the interaction and fun of a Spangler workshop experience to your home, school or any place you can find an Internet connection. #3: FedEx will bring the workshop materials to your home. As soon as you register for the workshop, we’ll put the wheels in motion to send you the same workshop kit you’ll see being used in the online training. Be prepared to perform dozens of amazing science activities with all of the necessary materials to get your students excited about science the very next day. #4: Participate in more than 30 eye-catching demonstrations and hands-on activities that help children pursue the why-factor of wonder, discovery, and exploration. Explore a number of great science ideas that encourage children to “play with a purpose.” By the end of the day, your head will be filled with creative ideas that you can put to use immediately. You’ll leave this seminar with the knowledge, presentation skills, and tools to make science the favorite part of your teaching day. #5: Take the fear out of teaching science. 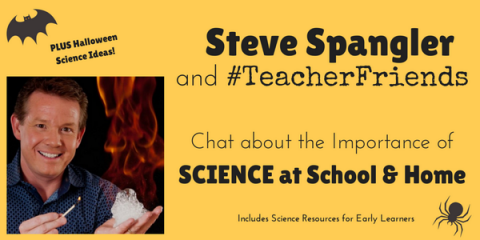 Steve Spangler will help you take the fear out of teaching science and become a more effective science teacher using simple and inexpensive materials… guaranteed! 5. 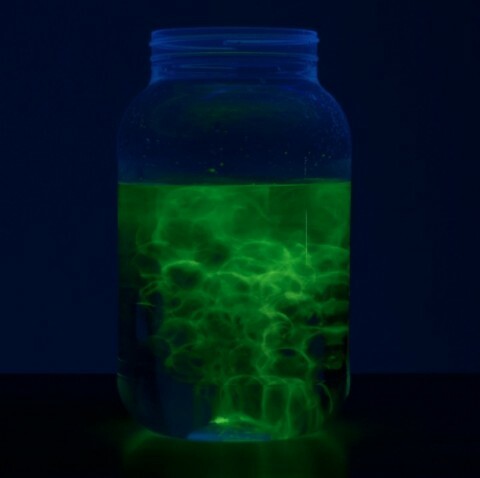 Halloween is right around the corner…what is your favorite Halloween science experiment? Read the entire Twitter chat? It contains a lot of additional links and resources and all of the great teachers who participated. This is a great article! For me being in Early Childhood this is great because sometimes science is put on the back burner for the real little kids. This gives me a better sense of understanding for early childhood science! I agree, science surprise everyone with its every new experiment. Everything surprise early childhood as there are most of the things which are new for them. You have beautifully described the difference between good and great teachers. How much a child is interested in a subject is depends on how he has being taught. I totally agree with the post. Thanks for sharing this. early childhood science education develops great interest in kids. They will understand it and do several task in their way and will surely love that.